The entire tutorial will be limited to editing a single file, src/common/Game.js for the sake of simplicity. All the Pong game logic is implemented in this one file. However, you may want to look around. The boilerplate directory includes a dist/index.html file, which will be served to the clients, and a main.js file, which is the entry point of the node.js server. src/client/clientEntryPoint.js is the entry point of the client. The game code is inside the src directory, and more advanced games will take advantage of the sub-directories client, server, and common to structure the code. Take a look at webpack.config.js which shows how the game is packaged, and .babelrc shows how the game loads the lance library. There are only two kinds of objects in Pong, the paddle and the ball. These classes Paddle and Ball are sub-classes of the DynamicObject class, and are quite simple. Open the file src/common/Game.js with your favorite editor, and find the GAME OBJECTS section. Remove the class YourGameObject and add the following two classes instead. The Paddle class has a constructor, and a netScheme. The netScheme lists which attributes need to be synchronized between the server and the clients. In this game we will synchronize the health of the paddle to all clients. The syncTo method copies netScheme attributes from another object and is required by Lance. Note that we also declared the constants PADDING, WIDTH, HEIGHT, PADDLE_WIDTH and PADDLE_HEIGHT which will be used later in the game logic. The Ball class is only slightly more complicated than the Paddle class. It has no netScheme attributes, but it does have a bending property. The default bending properties indicate that the client object's position should gradually bend towards the server object's position at a rate of 80% each time the server sends position updates. 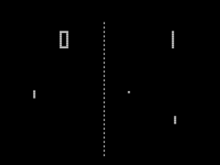 In the game of Pong, the Ball's velocity should not bend at all, because the ball's velocity can change suddenly as it hits a wall or a paddle. The GameEngine sub-class is called Game. It runs on both the server and the client, and executes the game's logic. The client runs the game engine to predict what will happen, but the server execution is the true game progress, overriding what the clients might have predicted. For Pong, we will need to bounce the ball around the board, and check if it hit a paddle. We will also need to respond to the user's up/down inputs. Find the GAME ENGINE section, which defines the GameEngine sub-class. The Game class implements the actual logic of the game. The methods are constructor() and registerClasses(). The constructor creates a physics engine, and registers event handler functions for the game. The method registerClasses() registers the list of DynamicObject sub-classes with the Lance serializer. Update the method gameLogic(), which was registered to run on the postStep event, with the code below. This method is executed after the ball has moved. It contains all the core pong game logic: it runs after every game step, and checks if the ball has hit any wall, or any paddle, and decides if a player has scored. The server engine will initialize the game engine when the game is started, and handle player connections and "disconnections". The client-side code must initialize the client, and draw the game on the screen on each render-frame. First, let's add some objects in the HTML file, found in dist/index.html. Fill out the following two methods. In clientSideInit() we bind the keyboard buttons "up" and "down" to emit events called "up" and "down", respectively. In clientSideDraw() we update the positions of HTML elements for the paddles and the ball. Once everything has been put together the end result should look like the pong sub-directory in the same repository. Open two browser windows and point them to the local host. The URL is http://127.0.0.1:3000/ on windows, and http://localhost:3000/ on a Mac. Your next steps might be to get a deeper understanding by going through the Spaceships Tutorial, which introduces the concepts and components of a Lance multiplayer networked game.